It's been a month since Illinois' medical marijuana program began dispensing the drug to patients approved for its use, and the state reports that more than $800,000 worth of cannabis has been sold since Nov. 9. Dispensary 33, Chicago's first—and so far only—dispensary opened its doors in Andersonville last week. And while medical cannabis dispensaries face a number of hurdles in the city, from location requirements to community objections, the Andersonville shop faced little resistance. There is nothing flashy about Dispensary 33. Nothing drawing attention to it. Its storefront windows are covered in a film with a molecular hexagon design that gives a hint—but not a look—at what's inside. 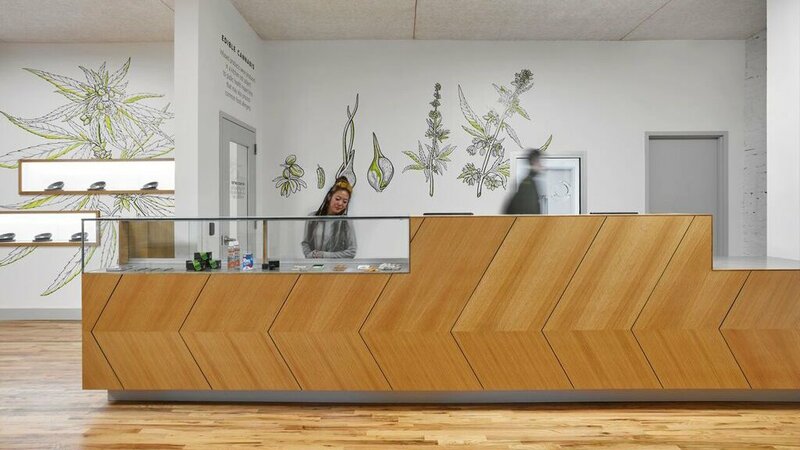 The owner of Chicago's first medical cannabis dispensary says the shop's appearance is meant to offer the respect and confidentiality afforded any medical patient. Dispensary33 is located on Clark Street in the Andersonville neighborhood, surrounded by auto repair shops and bars. Zises says he named his business 33 after the year in which Prohibition was repealed. And with Illinois joining 22 other states in repealing laws prohibiting the use of medical cannabis, more dispensaries are on the way. But there are still tough laws and regulations governing these new retail stores, especially where they can be located. One major obstacle for any dispensary in Chicago is obtaining a zoning change. For Dispensary 33, getting backing from the community was what Ald. Ameya Pawar (47th Ward) wanted before supporting a zoning change. The alderman, state elected officials and a number of community residents took part in the dispensary's ribbon-cutting last week. For the time being Dispensary 33 is the only game in town and behind the secure door leading from the reception area to the retail space is the product. It goes by such names as Maui Wowie, Holy Grail Kush and Cheese and Chong. The names may sound like a pothead's dream, but there is nothing dreamy about the more than 45 very serious medical conditions that the state says can be treated with medical cannabis. Paul Lee is the dispensary's manager. For a decade he worked in California's medical marijuana industry. While medical marijuana is now legal in Illinois, it remains illegal at the federal level. The Drug Enforcement Administration’s medical cannabis also does not come with medical insurance. All of the 211 patients that have so far registered with Dispensary 33 have to pay with cash. But patients in desperate need of relief from their illnesses seem to be finding the money. Starting Jan. 1, 2016 the Illinois Department of Public Health will be accepting petitions by residents to add debilitating medical conditions or diseases to the Medical Cannabis Registry Program. Petitions will be accepted through Jan. 31. For more information about how to file a petition and to access the form, click here. Some industry observers said there are a couple of major buzzkills facing the state’s program. We addressed those challenges with the chairman of the trade group Medical Cannabis Alliance of Illinois and a partner at a law firm representing two dispensaries. Gov. Bruce Rauner granted licenses to companies to grow and sell medical marijuana in the state. The move came after a review by the Rauner administration and the Illinois Attorney General, amid fears that Rauner would take months to reach a decision on the coveted licenses. As Illinois prepared for the implementation of legal medical marijuana, we took a look at some of the challenges and regulatory hurdles these businesses faced.